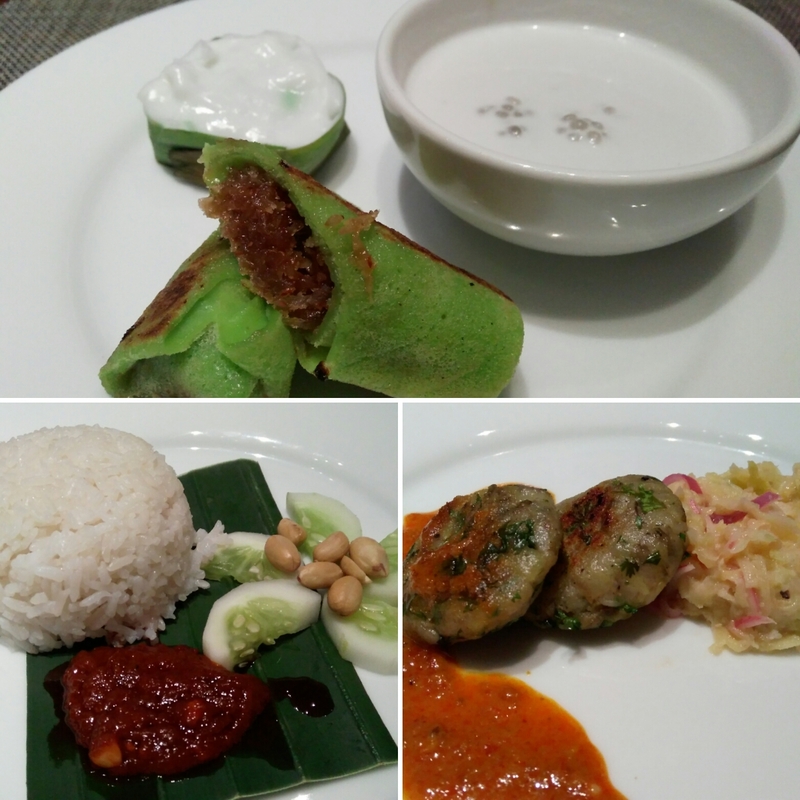 Fit Foodie Megha: A Fiery Malaysian Adventure by The Westin and Burrp! 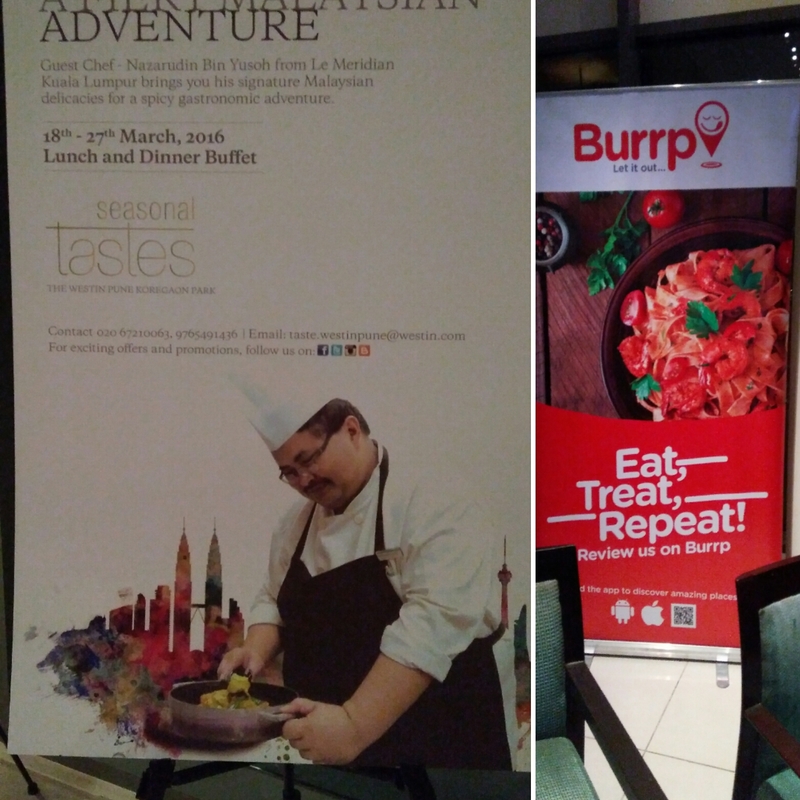 A Fiery Malaysian Adventure by The Westin and Burrp! Burrp doesn't need any introduction, perhaps the oldest food tech company in India, is back with new and improved version of the app. 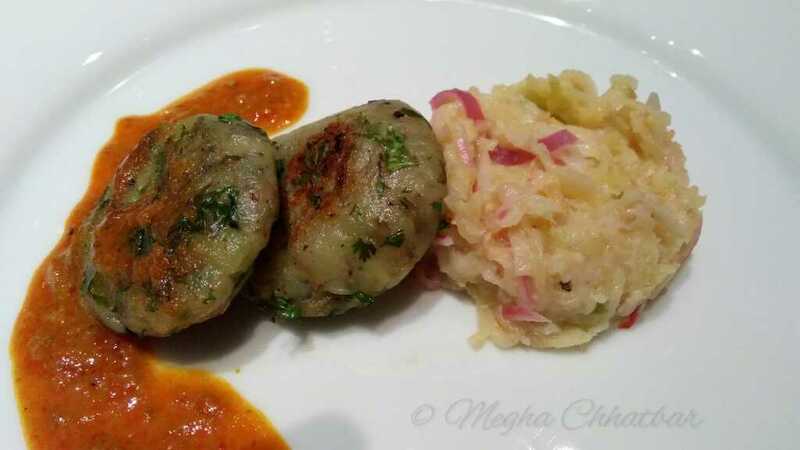 To revamp and to get feedbacks, a bloggers meet was arranged in Seasonal Tastes, The Westin, Pune wherein we were glad to be a part and taste the signature Malaysian delicacies by Chef Nazarudin Bin Yusoh from Le Meridian Kualalampur for the Fiery Malaysian Adventure festival starting from 18th March 2016 till 27th March 2016 at prices of Rs. 1049 lunch & Rs.1449 for dinner buffet! It was a double treat for all of us. Burrp has come up with some new and interesting features like the check-in, and recommendations of food in restaurants as in clear picture of what to eat in a restaurant. After some useful conversations, suggestions, queries we were served the awaited three course meal with some options for vegetarians as well. It was my first experience of having Malaysian food and whatever I know about it is its on the spicier side. Meals were pre-plated with pre-decided menu. Non Veg starters had Ayam kepal dengan pudina dan kuah percik, a chicken kebab with mint leaf and percik sauce then for vegetarians Bergedil kentang i.e deep fried potato cutlet went well with Kerabu mangga muda, a salad made with raw mango which was obviously sour. I felt cutlet could have more spices and be more crunchy. 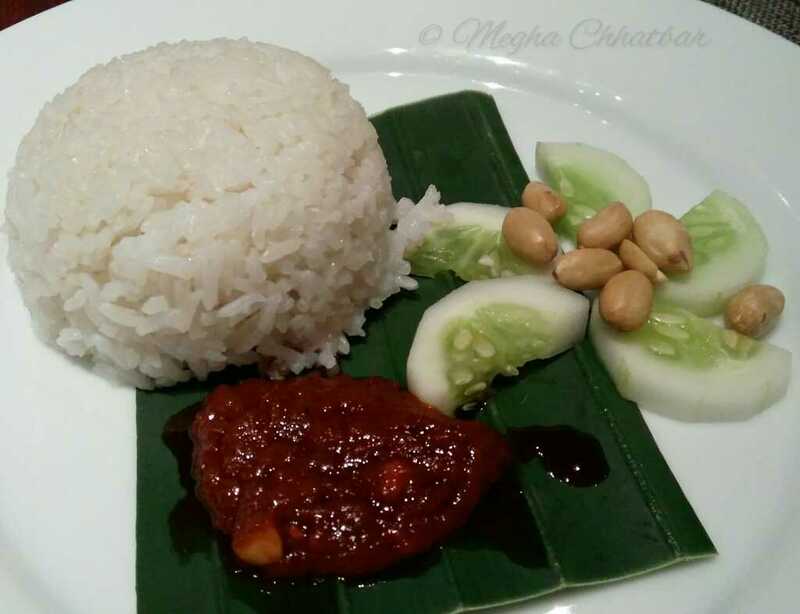 Main course started with flavoured coconut rice with chili paste, groundnut, cucumber and egg locally called Nasi lemak di hidang bersama sambal, kacang tanah, timun dal telur. Uff, so difficult to spell and remember! Non fancy plating here for this dish. Simple plain sticky rice with sweet chili paste, which I wished to be more spicy as to balance the flavours! Tofu wrapped with oats was very delicious; perfectly fried and crisp. Roti Jala dengan kari ayam, a net pancake looked interesting but was a treat for non veg lovers. Third and last course, desserts, I always look forward to. 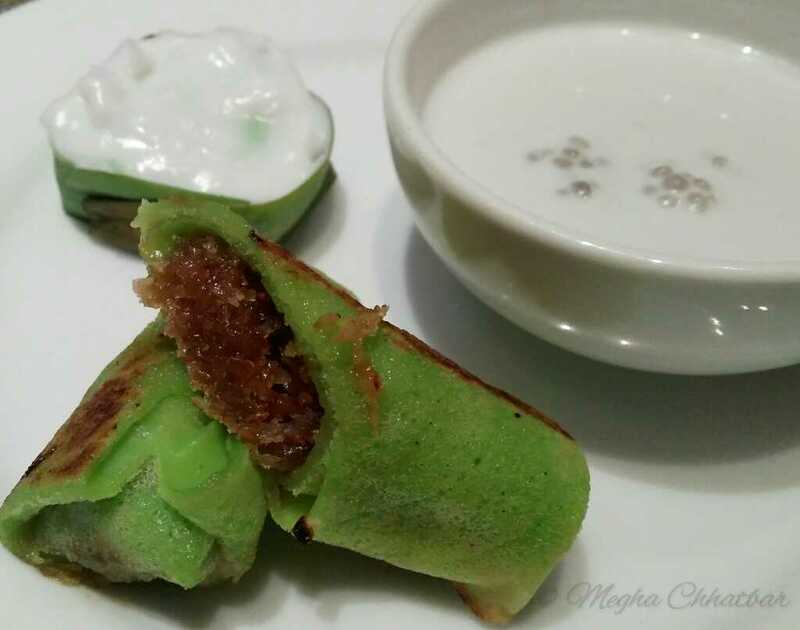 Tepung pelita (steam flour in pandan leaf) is soft-creamy textured with the coconut layer, cooked in banana leaf, most famous during ramadan. It was presented in a very cute banana leaf box with two colored layer- green and white. Kuih ketayap was the one of the best desserts served to us, basically, a rolled crepe filled with grated sweet coconut filling. I really liked the not-so-sweet filling. Sagu gula melaka was more like Sabudana Kheer as we call in India the difference being the coconut milk and palm sugar. 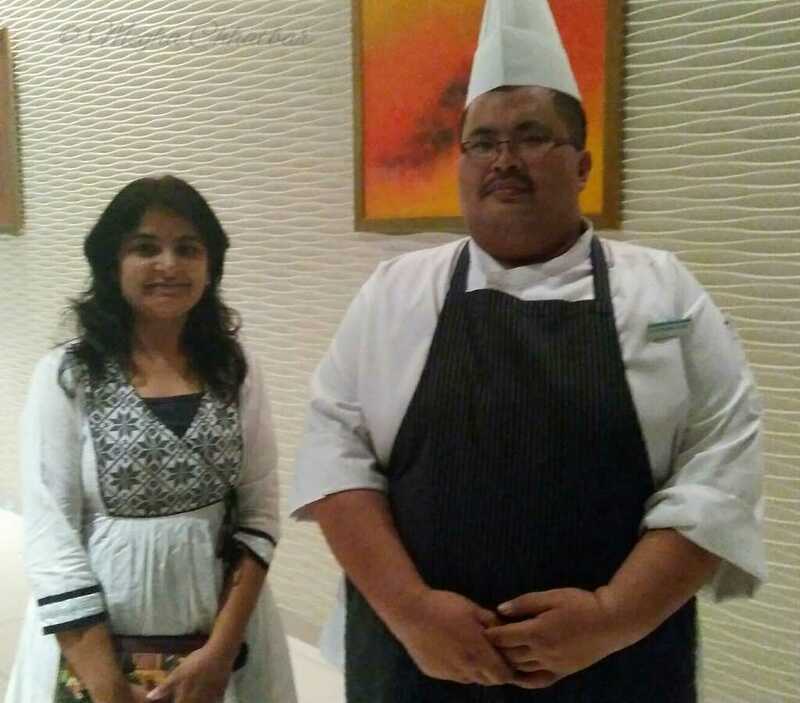 Post dinner, we had conversation and photographs with the chef. 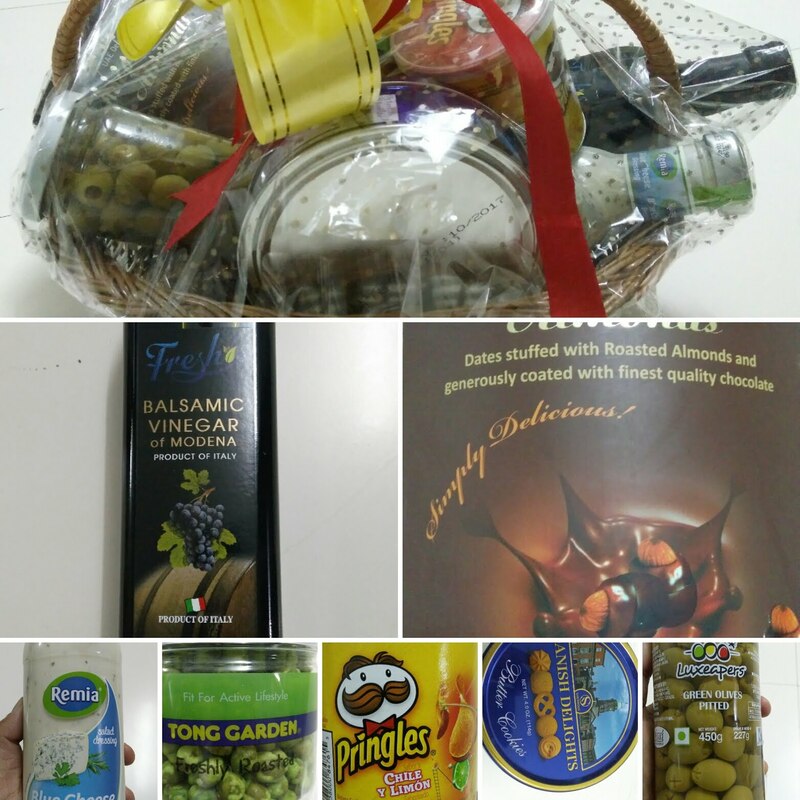 Overall, a fun evening to conclude with a gift hamper presented to us by Burrp! .